As a member of the Captain Cook Society I'm naturally an enthusiast of the great navigator: but it’s still sometimes surprising to discover the extent of other people’s admiration for James Cook in the most unexpected places. Rummaging among the bric-a-brac at a garage sale recently in suburban Canberra, Australia, I was delighted to find a china bread-and-butter plate on which somebody had painted a simple version of Cook’s Coat of Arms, together with their own tribute to him. I was happy to pay a dollar for it, to bring it home, wash off the dirt, and put the plate on the shelf among my own collection of Captain Cook books and small keepsakes, including a few shells and pebbles from some of the beaches where he landed during the voyage of HMB Endeavour. Indeed, I had it near me on the desk as I prepared a new edition of my book Captain Cook’s Apprentice, which Penguin Random House has issued on the 250th anniversary of HM Bark Endeavour leaving England. Now, I’m the first to admit that this little plate is no great shakes as an example of the china-painter’s art. The colour has not been very skilfully applied, it is unglazed and patches of blue are flaking off. Nor is the Coat of Arms completely true to the original granted posthumously to Mrs Cook in 1785. The fluted edge and well of the plate have been painted an azure blue, imitating the colour of the shield on the original Coat of Arms. But the shield itself has been left white with a polar star in dark blue north and south (as opposed to gold on the original.) It has a square rather than scalloped upper edge, and is surrounded by a kind of blue mantling rather than flags, again unlike the original granted by the College of Arms. The centre is the same hemisphere showing the Pacific Ocean, although the continents on the littoral are only crudely suggested. There is no red line showing the tracks of Cook’s three voyages, nor are the parallels of latitude and longitude depicted. Of course, Cook commanded Endeavour only on his first voyage, the latter two being on board Resolution. But for all its faults of history, heraldry and artistry, I find the plate curiously charming in its naivety – even rather moving. As the anniversary approaches of Endeavour’s departure from Plymouth in August 1768, the old arguments between indigenous and immigrant populations about Cook’s achievements are stirring again in the South Pacific nations that arose in his wake. In Australia, for example, there’s been quite a debate about certain statues of Cook that state he ‘discovered’ the territories of New South Wales and elsewhere. These lands, obviously, were discovered by their first indigenous inhabitants, and their descendants have every right to feel they’ve been ‘rendered invisible’ by those who give that honour to the Captain. There’s probably a good case for placing an addendum on such statues: but I think to rewrite the inscriptions or even remove the statues altogether would be folly. Nevertheless, the debates do testify to the continuing potency of Captain Cook as a symbol for all people touched by the subsequent histories of his voyages. 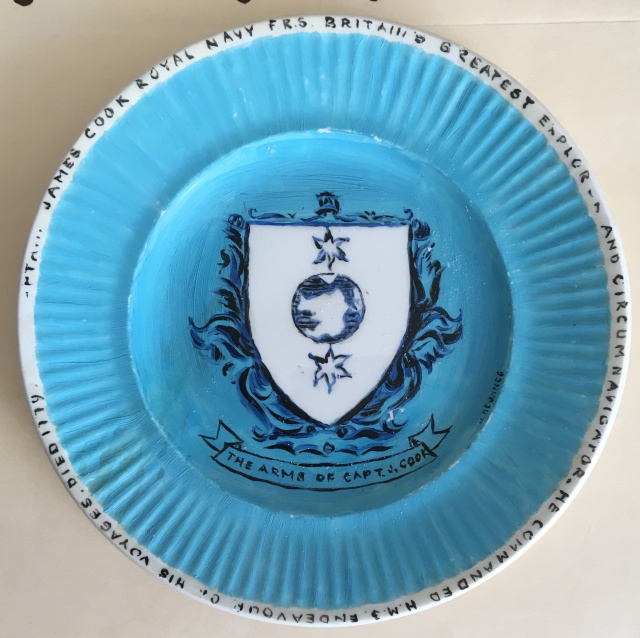 And so does this little blue plate, painted with a representation of Cook’s Coat of Arms. Here, in a remote corner of a garage some 17,000 kilometres from Plymouth, was found the testament of someone who sought – imperfectly, but with deep sincerity – to express an admiration of Cooks greatness as an explorer. And who understood that, from Cook’s first European charting of the eastern seaboard of New Holland, began the modern history of the nation we call Australia and which is now part of us. All of us. Together. * The Australian, 16-17 September 2017, page 19.